Over the past few years, British Columbia and Quebec have had their share of common goals. The two provinces consistently outrank all others as places where environmental concerns are paramount. Discussions related to pipelines and energy projects have been different in these provinces than anywhere else in Canada. While Quebec has long been regarded as a unique region within Canada, British Columbia is starting to show some differences when compared with other western provinces. In a Research Co. poll conducted earlier this year, a whopping 66% of British Columbians said they had more in common with the people of Seattle and Portland than with other Canadians. Even at a moment when views of the United States have soured considerably over the presidency of Donald Trump, British Columbians appear to keep the dream of “Cascadia” alive. However, the expressions of fondness for the people of Washington state and Oregon did not create a drastic change in how British Columbians perceive themselves and Canada. Three in five residents (61%) believe the views of British Columbians are different from the rest of Canada, and only 17% thought the province would be better off as its own country. A question on identity also showed that 60% of residents consider themselves “Canadians first, British Columbians second” while 22% placed their province ahead of their country. A few weeks have passed since voters in Quebec elected a new government, led by the Coalition Avenir Québec (CAQ). The democratic process ended with the lowest voting percentage for the province’s traditionally dominant political organizations: the federalist Liberal Party of Quebec and the sovereignist Parti Québécois (PQ). The early actions of the new government provided an opportunity to ask Quebecers about themselves, their place in Canada and their identity. For starters, the notion of sovereignty has become unpopular. 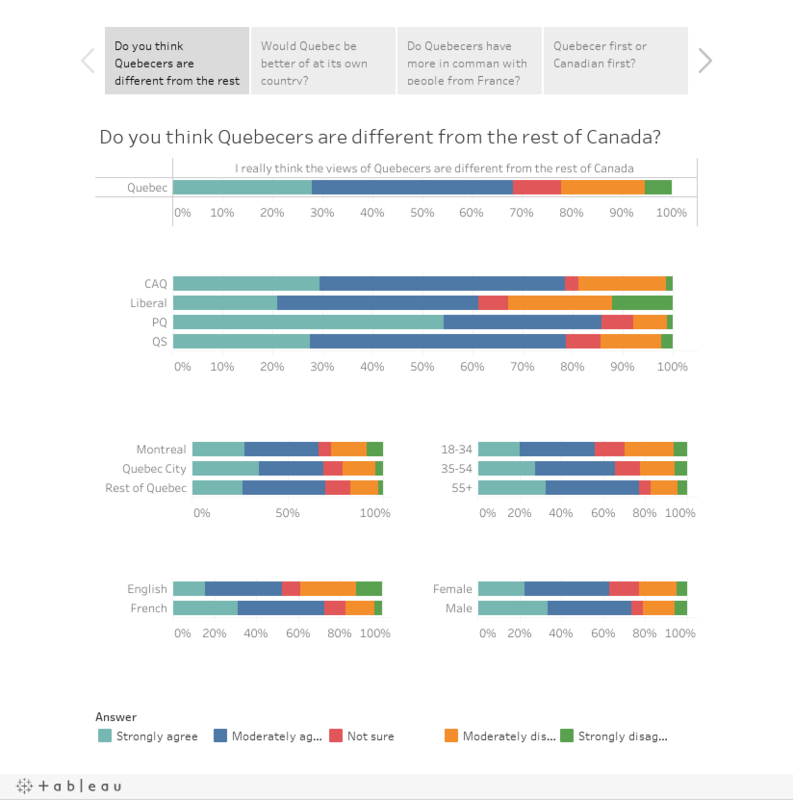 A majority of Quebecers (53%) disagreed with the notion of Quebec being better off as its own country. Only 34% of Quebecers still dream of an independent Quebec, most of them supporters of the PQ. In Quebec, two thirds of residents (68%) think their views are different from the rest of Canada – seven points higher than what was observed in British Columbia this year. Residents of these two provinces are looking at things differently, especially after recent political changes in Ontario and an at times unfriendly relationship with Alberta. More than half of Quebecers (51%) disagreed with the idea that Quebecers have more in common with the people of France than with the residents of other parts of Canada. British Columbians may find Cascadia compelling, but few Quebecers are looking at the other side of the Atlantic Ocean for a sense of brotherhood. However, the main issue that could change matters in Quebec is identity. Almost half of residents (48%) consider themselves “Quebecers first, and Canadians second” while just over two in five (43%) place country ahead of province. This might be the biggest hurdle for federalist forces in Quebec. Outright support for sovereignty is at one of its lowest points, but identity continues to be a more contentious topic here than in any other province. Men, Quebecers over the age of 55 and those who reside outside of the Montreal metropolitan area are more likely to eschew Canada and refer to themselves as Quebecers. It is not a surprise to see a huge majority of PQ supporters say they consider themselves “Quebecers first” and very few Liberal voters share this view. The problem lies in the 57% of CAQ voters and the 74% of Québec solidaire voters who also put Quebec ahead of Canada. These are newly engaged citizens who are fond of their leaders and policies. At this point, British Columbia is not having an identity crisis, in spite of the acrimonious tone that the electoral reform referendum is taking. New political parties are not expected to dominate the provincial agenda. There could be a very different story developing in Quebec. If the CAQ government falters, the prospect of another “us versus them” debate that engulfs provincial and federal administrations could be devastating. Yes, federalist Canadians can breathe easier after seeing that only a third of Quebecers currently want to leave Canada. But the fact that almost half of them do not see themselves primarily as Canadians should be concerning.